In the frozen Aisenfell, hardiness and cruelty are survival traits. It is no surprise the orcs there have changed in a land where dragons are hunted for food and where abominations roam the ice. A breed apart from normal orcs, the Aisenblut are known for hostility and supernatural power. Their pale, dappled grey skin, thick white hair and almost colourless blue eyes with catlike pupils mark them as different. Many Aisenblut are known for living without fire, preferring to salt their kills or hanging them so they develop a game taste. 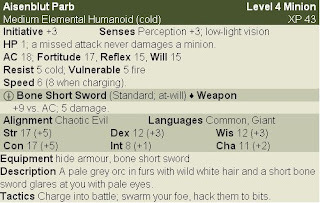 The parb are the weakest warriors of the Aisenblut orcs, analogous to the drudge. Like drudges, their concept of honour is non-existent and they enjoy charging at enemies and swarming them. Unlike them they learned clubs are useless for hacking and employ bone-bladed short swords that can cut blocks of ice out of a glacier. Their sensitivity to fire is such they avoid it at all costs, preferring the chill of the glaciers and the small igloo-like dwellings they make. The mestetel are fierce hunters analogous to the raider often harrying their foes and prey across ice sheet and glacier. They dislike fire intensely and aim a javelin at torch bearers and other fire-making types. They are wiry but as strong as a parb and often intimidate them. 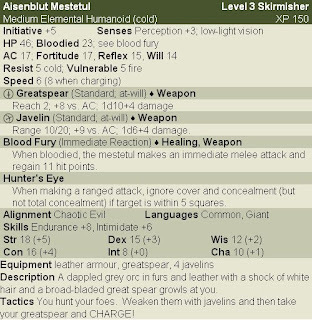 Their hunter's eye ability makes them fearsome foes in a skirmish where a javelin can find people who mistake partial cover as insurance against pain. Their ability to pick out a concealed target and strike it with a javelin makes them deadly hunters and feared opponents. The mestetul is also feared for charging the enemy with great spears - their superior reach often carries them into a shield wall with devastating impact. Mestetul are keen on skewering enemy leaders as trophies. 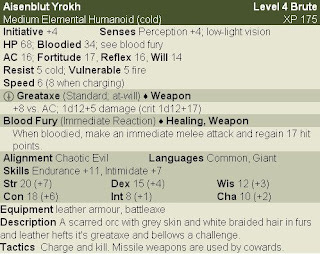 The yrokh corresponds to the orc berserker and it at least keeps with ancestral tradition as a blow from it's greataxe will crush the weak who it despises above all things. The yrokh is a brutish mass of dappled grey orc muscle and sinew, it's ice-blue eyes menace all they see. The yrokh braids the fingerbones of their fallen foes into it's hair and revel in senseless carnage. For them, there is only kill or be killed and death in battle is chosen over retreat. This attitude leads to a short, brutish life filled with other people screaming - this pleases the yrokh well. It will serve those who are stronger but an yrokh will test for weakness. A shamanic leader of the Aisenblut orcs though it serves an aspect of Gruumsh fitting to it's chill environment. It's skin is bone white, shaven and scarred and it's single blue eye radiates a chill light that invigorates other Aisenblut in battle. The glazazimoi will inspire other Aisenblut orcs to fierce charges and use it's eye of winter to weaken a foe for allies to finish. If it is close to a group it will use it's freezing blast ability to weaken foes then keeping close to it's allies for them to benefit from the relentless chill and incite blood fury. The glazazimoi often forms the tactical nucleus of a group and works as a shamanic advisor to the orcs of it's tribe. Unlike the eye of Gruumsh, it is much more inclined to tactics and defensive fighting (for an orc anyway). On death, the glazazimoi's eye shines with an eerie blue chill that coats it's spear and the flesh in frost, allowing one final attack before the glazazimoi finally falls over, heart shattering into ice. 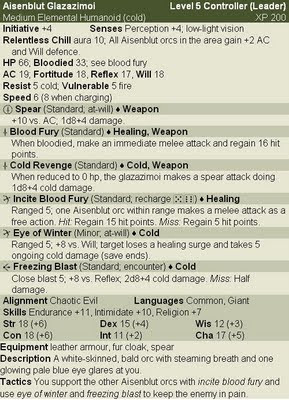 The cold revenge is a gift from the Elemental Chaos stolen by Gruumsh when the orc race was still in it's infancy.